Last Saturday, an hour before the game against Auburn, I ventured out to Wegmans. Since having knee surgery on April 2, I hadn’t stepped out of the house on my own for four days, so I went grocery shopping. It was time to test my stiffening joints. As I made my way up and down aisles at tortoise-like-speed, I noticed folks stocking up for the big game: beer, chips, frozen pizza, salsa, pretzels, seltzer water, Special K, instant dinners, etc. Grocery carts filled with anticipation, hope, nerves, and junk food. The atmosphere inside the store felt like Christmas, like the Super Bowl, like Thanksgiving. There was definitely something in the air. As Holy Week and Easter approach, I think we experience similar feelings and expectations—minus the junk food. Holy Week brings with it palm branches waving, dinner with the disciples in an upper room, a search for meaning behind Jesus’ death on the cross, and joyful shouts of “He is Risen! He is Risen, Indeed!” Around this time of year, the air fills with the expectation of new life, new beginnings, life over death, and Resurrection. Yes, next week, as Jesus’ story reaches its dramatic conclusion, our hearts and minds strain for answers our comprehension. The redbuds announce spring’s arrival. The white oaks sing their praises. The warming winds tell the story of seasonal change. And on Easter Sunday, the air fills with alleluias. Our Thursday E.A.T. (Everyone At the Table) meals begin on April 11 and go through May 30. During that time, we will gather for dinner at 5:30 p.m. at Common Grounds for a simple meal (to sign up to bring a portion of dinner, click here). Some of our sumptuous meals include lasagna, hearty soups, salads, breakfast for dinner, pizza, and more! 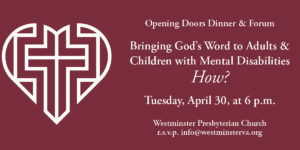 Included, as well, is our Maundy Thursday service at 6 p.m. over a meal in the Fellowship Hall. If you would like to volunteer to bring a portion of one of the meals, click here. I want to thank everyone for the heart-warming retirement recognition and reception! Your words and gifts meant more to me than I could ever adequately express.